Descarries reported "naked" CNS axon terminals (lacking adjacent post-synaptic elements) labeled by 3H- noradrenaline and in later studies with 3H- 5-hydroxytryptamine . Only 5 % of the varicosities formed with 5-HT were associated with identifiable synapses . The suggestion of transmitter release from non-synaptic sites led Agnati and Fuxe to construct a theory of volume transmission [149,150]. Jansson and colleagues at Karolinska Institute studied both transmitter releasing 5-HT axon varicosities and 5-HT2A receptor elements identified by electron microscopic immunocytochemistry . They found few close contacts between 5-HT terminal-like varicosities and 5-HT2A-IR neuronal structures, suggesting that 5-HT2A receptor mediated 5-HT transmission in the rat forebrain is mostly volume transmission mediated by short distance diffusion in the extra-cellular space. Figure 10. This figure is from reference . Panel A represents a "tripartite synapse" with pre- and postsynaptic elements tightly ensheathed by glial cells and extracellular space shown containing a grid or extracellular matrix. Panel B shows an open synapse, which facilitates communication at a distance via diffusion. The rate of diffusion varies, depending on the ECS diffusion parameters a for volume fraction, X for tortuosity, and nonspecific uptake k'. Reproduced with permission from Physiological Research. This theory of volume transmission attracted supporters [152,153] and detractors [154,155]. Similar nonsynaptic nerve endings have been found in peripheral autonomic ganglia  and probably function in some circumstances. Another group of workers focused on the complex and highly organized CNS extracellular space  and the extracellular proteoglycan matrix that envelops some synapses [157,158]. These extracellular proteoglycans provide an extracellular anionic cap around certain synapses; manipulations of the proteoglycan matrix alter their function . The extracellular matrix restricts diffusion of synaptic membrane receptors [160,161]. Astrocytes are important barriers to diffusion, retarding "spillover" to extrasynaptic receptors . Glial reactions may change diffusion properties near synapses. The magnitude and significance of volume transmission remain uncertain. Volume transmission may be important in certain regions at certain stages of development and unimportant in others. Exceptions to the standard model continue to be found. Guillery wrote of "a Doctrine of the Neuroscience Church" and said, "today there has to be serious doubt about this"  (the centrality of the standard neuron doctrine). Complex CNS networks use fast wiring transmission, including gap junctions, slow synaptic messages and slow volume transmission using extracellular messages possibly influenced by the proteoglycan nets ensheathing certain classes of neurons. Figure 11. (A) This drawing illustrates mechanisms of glucocorticoid modulation of excitatory hypothalamic synapses, as reported in reference . Glucocorticoids act at GR (glucocorticoid receptor) to stimulate endocannabinoid (eCB) synthesis in the postsynaptic cell. 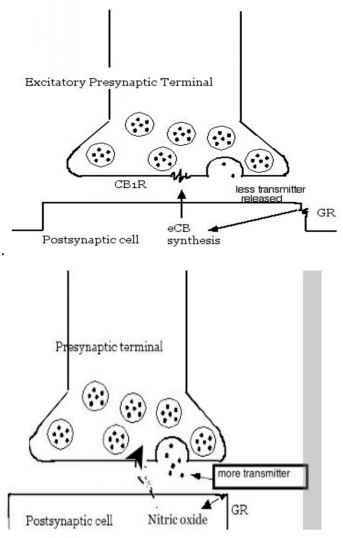 Cannabinoid acts at its receptors (CB1 receptors) on the presynaptic membrane. This reduces the amount of transmitter (glutamate) released. (B) Inhibitory hypothalamic synapse (GABA synapses): GCs act by membrane receptors to activate nNOS in postsynaptic elements, producing nitric oxide which diffuses to presynaptic GABA terminal and stimulates release by as yet undefined pathways. Retrograde synaptic transmission is now an acknowledged fact. Retrograde transmission and its complexities are sobering. Endocannabinoids modulate both electrical and chemical transmission; 2-AG (2- arachidonoylglycerol) is a well studied retrograde synaptic messenger [165,166] Consider the recently described regulatory effects of glucocorticoids on retrograde transmission in fast amino acid synapses  shown in Figure 11. Fast wiring transmission is dominated by GABA and glutamate neurons. Monoamines and endocannabinoids are important slow transmitters, often acting indirectly to modulate fast synapses. Wiring becomes preponderant over volume transmission in the mature brain, but disease may change this. Gap junctions are one class of electrical synapses, not readily visualized by electron microscopy [168,169] and are prominent in the developing nervous system. They provide cytoplasmic continuity between cells, often between groups of astrocytes . They often use purinergic messages. Hemichannels (one gap junction includes two channels) discharge messages into the extracellular space . Table 3. Change is the critical variable. Immature cells release messages and respond to external messages, but are poorly differentiated. CNS information processing is influenced by physical injuries, which alter brain extracellular spaces and produce increased numbers of glial cells, as well as influx of bone marrow-derived inflammatory cells. How may one distinguish transmitters and neuromodulators? We may be tempted to say that a neurotransmitter is a substance that acts to change the function of ion channels and modulators act at other kinds of receptors. However, the same molecule may act at many different kinds of receptors. Some signals may change macromolecules rather than being recognized by receptors- nitric oxide is a classical example. 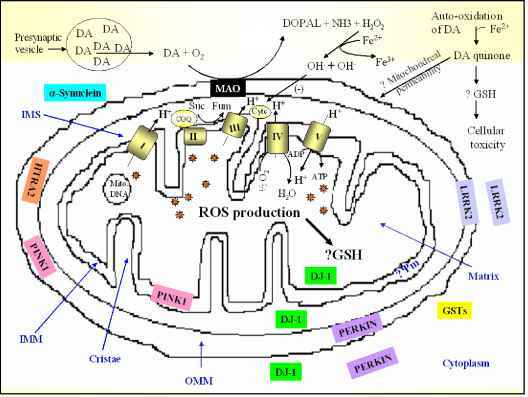 It can change tyrosine residues to nitrotyrosine and alter the function of important macromolecules . We often use speed of signaling to categorize synaptic transmission . Adenosine, nitric oxide, prostaglandins and CO2 may be considered modulators because they are released at non-synaptic sites and their effects develop more slowly than those of classical transmitters . Slow synaptic potentials, such as the M-current, are well known . Drugs like retigabine, which modulate M currents, may have important roles in treatment of epilepsy, pain and psychiatric disease .